At first blush The Gin Game appears to be a love story about two elderly retirees who meet at the dilapidated Bentley Nursing Home where they have gone to live out their remaining days. 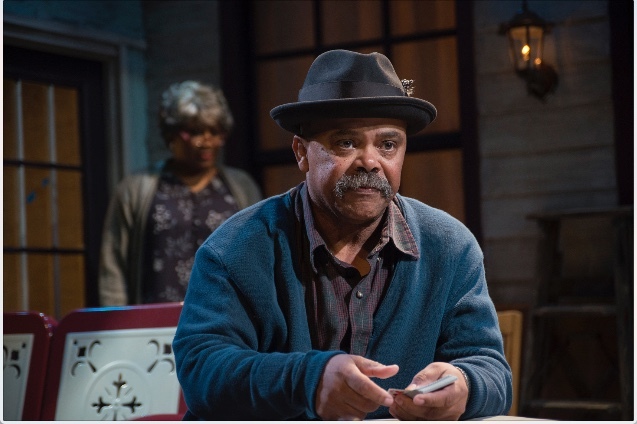 But playwright and Baltimore native D. L. Coburn had something deeper in mind – something that bares the soul and makes us reflect on how without warning, and just as we thought we had established a secure place in the world, Life with a capital ‘L’ can throw us a curveball. 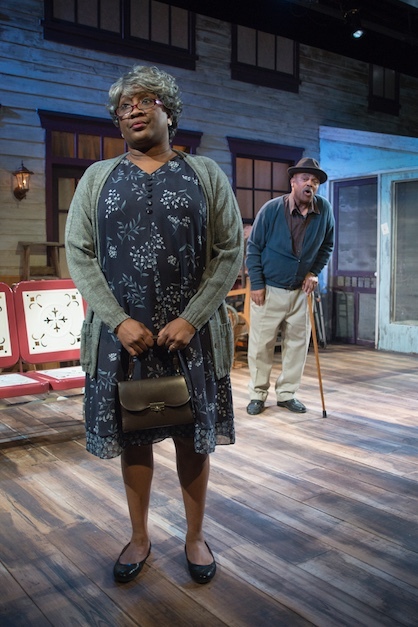 Director Thomas W. Jones has cast two seasoned actors, Roz White and Doug Brown, who together keep us on the edge of our seats with their subtle and riveting development of these complex characters. 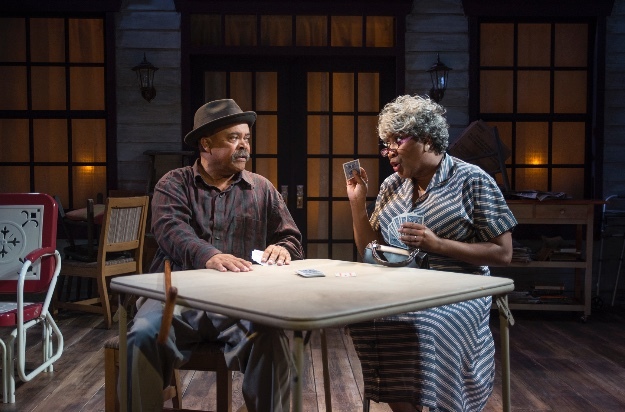 Fonsia Dorsey and Weller Martin, relative newcomers to the home, begin a friendship of mutual admiration with a dollop of flirtation tossed in for good measure. Weller presents himself as a courtly gentleman and successful businessman eager to gain the approval of the prim and proper Fonsia. They soon bond over their mutual loathing of the staff, their exes and the other residents, whom they superciliously agree, are feeble-minded codgers. After some polite conversation Weller suggests they play his favorite card game, “Hollywood” Gin. Over a series of games, he patiently teaches Fonsia how to hold her cards (close to the vest) and schools her in the rules and the scoring system. But he is no Henry Higgins, and she will not be his Eliza. As they begin to shed their social masks with each hand they reveal more of themselves. He hates the home’s organized entertainment and the way the staff infantilizes the residents, and she is lonely, imprisoned by her fears and brokenhearted. When Fonsia continues to defeat him with every hand she’s dealt, all social niceties fly out the window and Weller becomes enraged. He calls it luck that she consistently has winning hands. He even claims there are spirits at work. Until finally, he accuses her of throwing the game. Determined to win a hand and preserve his ego, he begs her to keep playing, manipulating her through flattery and apologies for his blasphemous outbursts. “Now if I win, don’t shout at me,” she implores. By the time a mere week has passed, she has begun to echo his demeaning behavior and they charge full throttle at each other’s defenses, until the gloves are off and they go straight for the jugular. The Gin Game is a psychological exercise meant to hold a mirror up to our faults and frailties while shedding light on the challenges of aging, loneliness and the uncertainty of a future without friends or family. It asks us to take responsibility for the emotional damage we inflict on those closest to us and to recognize that our resulting pain is the reflection of our actions. This rare gem of a tragi-comedy has been performed by some of our nation’s finest actors. Hume Cronyn and Jessica Tandy starred in the original Broadway production at the John Golden Theatre in 1977 and Tandy won a Best Actress Tony Award for her portrayal of Fonsia. 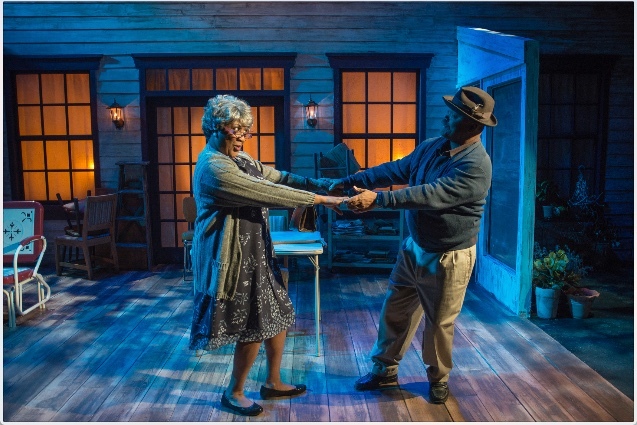 In 2015 James Earl Jones and Cicely Tyson took over the roles in the same theatre. Recommended for its superb performances by two of the finest actors in our area. At MetroStage through March 12th – 1201 North Royal Street, Alexandria, 22314. For tickets and information visit MetroStage Info.